The Indianapolis Colts have been the feel-good story of the NFL this season, what with their turnaround from the league's worst team to the AFC's fifth seed while head coach Chuck Pagano stepped aside to battle leukemia. Today, three months since his diagnosis and two months since he learned his cancer was in remission, Pagano returned to work, which is pretty terrific news. 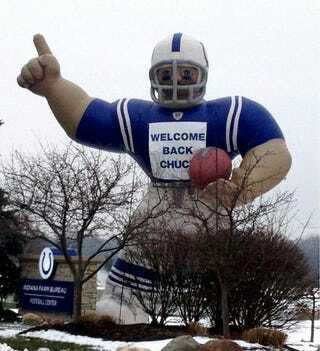 The giant inflatable that always greets visitors at the team's practice facility welcomed his arrival.